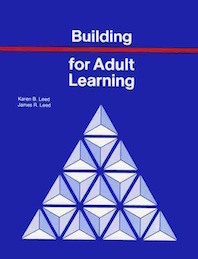 Building for Adult Learning is a handbook for the person responsible for the environment in which adults in an organization will be learning. The focus is on “the room”, but space is only part of a successful learning experience. Program content which meets the learning objectives, delivery of the content in a style congruent with the organization’s culture, the support services (e.g., registration, parking, food, sleeping, recreation, etc.) and the management of the entire experience for the learner and instructor all contribute to successful learning. This book will help the person who has a “training room”, is moderately happy with it, but wants to know how to improve it. It will help the interior designer or architect who wants to create effective adult learning environments. It will help the team coordinating a conference center to work together for the learner’s benefit. This hand also assumes that the reader is interested in organization-related training and development, not public education. The clear purpose of organizational training and development is primarily related to the growth and development of the organization. Job training, therefore, is the number one concern. A second focus could be on customer training, as part of the marketing effort of the organization. A third focus is self-improvement of both employees and customers. The effects of this last goal are long-term and are not seen in the short run.